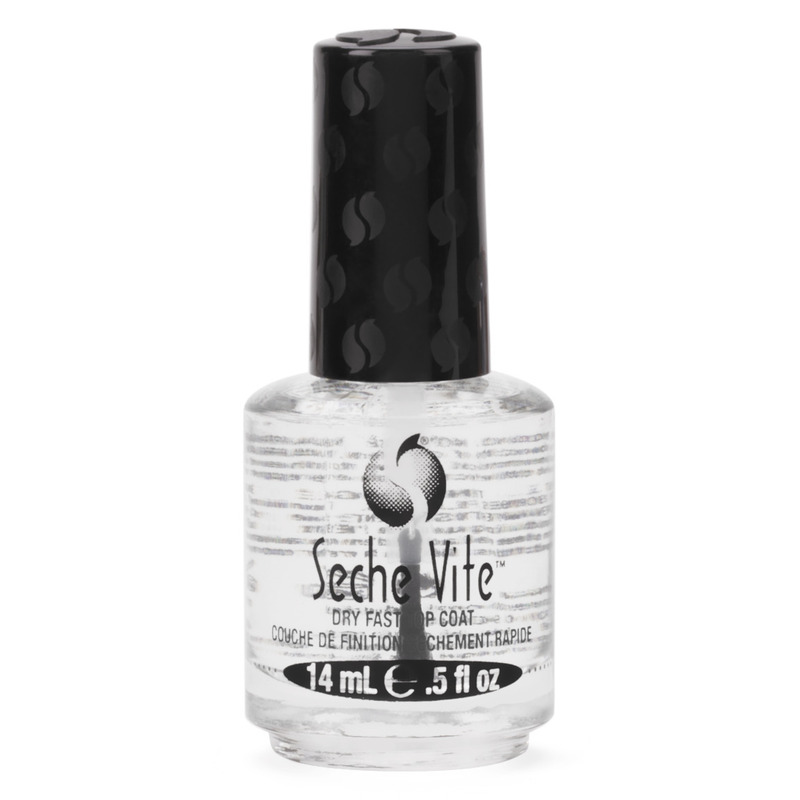 Seche Vite is a dry fast top coat is widely acknowledged as the world's finest top coat. Its patented formula penetrates through the nail lacquer to the base coat forming a single solid coating over the nail plate for a much more durable finish, guaranteed not to yellow and leaves nails silky, stronger and resistant to chipping and peeling. 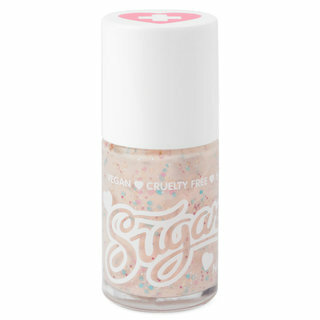 Apply thickly, get a nice bead on the end of the brush then layer softly over nail color or directly on to clean nails. Seche limits what I dont like about topcoats and provides what is great about them. Its my most used top coat. When I bought my first bottle of seche vite... clouds opened up, sun shone down on me, someone pulled open the drapes, people threw me up on their shoulders and started chanting like i won the world series, a parade and dance party broke out and we all danced with dry shiny chip resistant nails. best top coat, but strong odor. Why Do People Rave About This?! 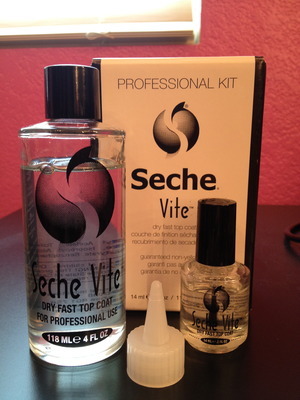 Seche Vite does what it's name says "Drys Fast" but what it does not do is anything else! I can literally peel Seche Vite off my manicure within hours. It chips & does not protect my mani. The smell is horrible & strong also! Before I even finished the bottle, it was drying up & was very goopy leaving my mani patchy! I will forever love the Seche Clear base coat, but as for a top coat, Sally Hansen Mega Shine all the way! I use Seche Vite at work as my top coat of choice. The salon I work in used OPI, and we currently use a Swiss brand called Mavala. Both are very good brands but I would only ever use Seche as my top coat. The tricks with this product are to apply on to wet polish, and to allow the product to spread itself. Let the Seche almost fall off the brush, so you have a bead of product, and then guide it over the nail rather than using lots of brush strokes. This way you won't pick up any colour on the brush or disrupt the perfect polish application you've just spent time on! This may possibly be the holy grail of top coats. It adds such a lovely finish to my nails, even after a few days they still look shiny and brand new. It's ridiculously fast-drying. My dry time for most polishes is about 10 minutes. Great for if I'm about to drive somewhere. The polish is self-leveling, so it evens out even the most chunky glitters. Sometimes I've accidentally touched it while it's still wet and ten minutes later, the dent is gone. As amazing as this product is, it still has a few downsides, none of which are major enough (in my opinion) to stop using the product. One downside to using this is the smell. Oooh, the smell. But if you're willing to sacrifice a little temporary damage to your nostrils, this is well worth it. Another is that this top coat is not 3-free. It has toluene, but luckily not the other two, DBP and formaldehyde. My only MAJOR concern is that sometimes if I put a little too much on, I get shrinkage around the tips of my nails. This normally wouldn't be that big of a deal, but as an art student, I have my hands in water... A lot. If the shrinkage is too drastic, sometimes the entire "sheet" of nail polish will lift up and peel completely off. This is the only top coat that I've had that happen with. It's easy to get around, but sometimes when I'm in a rush my coats get a little heavy. Has anyone else had this problem? This is an awesome top coat! It's a dry fast top coat, non-yellowing, gives your nails an amazing shine. I bought the professional kit at Cosmoprof, for I think around $20. It comes with a 4 fl oz. refill and a regular .5 fl oz. I notice that this top coat is a little thicker than most top coats. If it does get thicker you can purchase the Seche Restore. I had heard all the craze about this top coat so I finally gave in and purchased it at the local beauty supply store. It almost looks like you have a thick shiny coat of gel over your polish. I notice that it enhances the color of EVERY polish i have used it with. It's honestly amazing. It does dry pretty fast, but i'm impatient so I don't notice that as much. The glossiness and shine are amazing. The only bad thing i noticed was the intense smell of this polish. It just seems more potent than other polish. I don't care either way because polish smells in general so I just open a window and end up with gorgeous shiny nails. At first I didn't like this top coat because I noticed that my nail polish would start to peel after a few days. Sometimes it would come off in one piece and sometimes it would chip off after a day which really annoyed me. I was really disappointed to begin with but after using it several times I actually really like it now. It still peels if I do it intentionally and that's usually because I'm bored, lol. But it maintains the shine up until you decide to remove your manicure. It makes your manicure last a lot longer but I think it also depends on the type of nail polish you're using under the top coat. I also love that it dries amazingly fast. I'll probably keep coming back to this one since I ended up liking it after I gave it another chance. "[Seche Vite] leaves nails silky, stronger and resistant to chipping and peeling." I don't know about all that. While it does dry my polish quickly (which is definitely a plus! ), it doesn't quite make them "resistant to chipping and peeling." For example, I just painted my nails last night. One layer of base coat, two coats of varnish and one coat of Seche Vite. Now, not even 24 hours later, my varnish has peeled away to nothing but bits on the sides. Also, unless you apply this top coat while your varnish is still pretty wet, it makes the varnish "shrink" (it pulls your varnish away from the tip, quite like a week of tip wear). It does, however, leave a really nice shine to the nail & leaves them feeling really strong. While the dry time is a plus, I find I get longer wear time without using it. So, unless you don't mind re-painting your nails every day or two, I wouldn't recommend this product.